Hollings' due date was yesterday and she is 13 days old today. I think if I blink BellaRose will be in college tomorrow. Our girls are bringing us such joy! We adore these precious bundles of joys! We are still just absorbing the time with BellaRose and Hollings. The weather is forcing us to stay inside for the most part. The cabin fever does set in but the visits from friends and family have really made it wonderful. I have loved this winter with all the snow, but I have to say now I am looking forward to warmer weather and not having to bundle the girls up to go outside. I guess having a newborn has changed my perspective on the weather a little bit and also having the ability to walk and actually breath!! I am ready to get outside now. 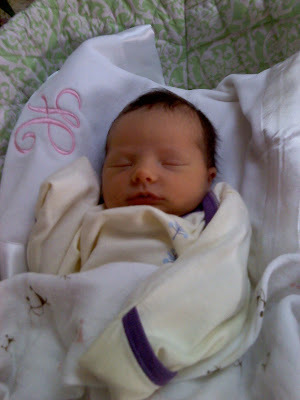 So here is a picture of Hollings in her crib for the 1st time. I just put her in there yesterday to "see" her mobile and check out the surroundings. The quilt my Aunt Carol had made and JT monogrammed for me. It is gorgeous. She also had a little blanket made for BellaRose's baby doll and a stroller blanket. Beautiful! Blue eyes? Green eyes? Brown eyes? Who knows, they all run in the family. Momma does exist. Here is some momma love for you. Goodness these girls are just precious. ...a whole lot of love! Our little Hollings is a week old now. Hard to believe. I know I will say that her whole life, as I am saying the same thing about BellaRose's life. Hollings has been a complete dream. We feel so blessed by her. I am sure you know but I was pretty nervous to bring a newborn baby home. It was SO hard with BellaRose, we were in-experienced and completely sleep deprived, healing was tough, BellaRose was fussier and I just thought that is how all newborns were. This time we are calmer, rested even, and know what to expect a little more. We have gone out to eat. It feels good to feel normal. Hollings hardly fusses unless there is a need, healing is not as dramatic, things are just easier. I know we are only a week in, and I know things can change at a moments notice, but so far so good. We have been so blessed by your visits and your calls and your love, it has meant the world to us! BellaRose is doing amazing! She has her moments where she needs the attention and where she needs to just be 2.5. She takes such good of baby sister. As you can see in one of the pictures below she is patting her belly and looking at the mylicon bottle. So sweet. She gets a little freaked out when Hollings cries and says it is too loud. I wish she could have heard herself cry! That was loud. 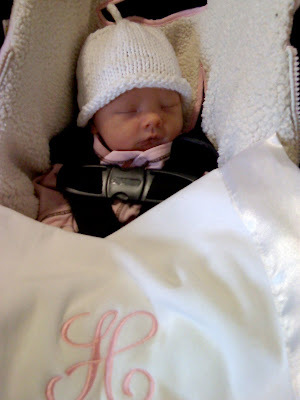 Hollings had her one week appt. last week and she is almost up to her birth weight so they gave us the freedom to let her sleep at night and we don't have to wake her. That is wonderful news! Here are a whole lot of pictures from our week. It is difficult to narrow them down! BellaRose being a cowgirl! My dreams would come true! Holding her head up like a big girl! My sister pointed out to me the other day that I said something about "my girls" and how neat that sounded, and it really is neat! It fills me with pride to say "my girls". Like I said with BellaRose these girls are my heart! Today I would be 39 weeks but instead I have a 4 day old newborn, who is awesome. We have been so blessed by Hollings' arrival. She is so sweet and so good!!!! Praise the Lord is all I can say! 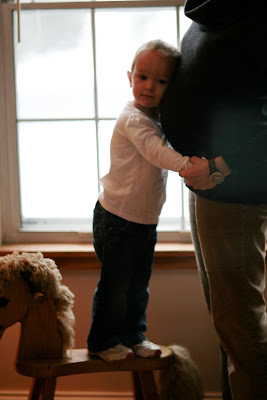 I have to tell you it is a very strange feeling to have a baby before your due date. I just keep thinking that I am supposed to be pregnant and waddling around, but instead I am healing and adjusting. Worth knew I would be early, I was really really slowing down. It all worked out great. Worth had been traveling for work and he was supposed to be gone on Saturday but the Wild Game dinner he went to was rescheduled for Saturday night so he stayed in town. Praise the Lord is all I can say! BellaRose and I had a really sweet night that night too. We even made some cookies together because she was being so good. I am so thankful for that night together! Everything just works out doesn't. All the worries that kept me up at night seem to be so silly now. I was so worried about having a newborn again, but Hollings so far as been an absolute angel! BellaRose meeting Hollings for the 1st time! This is at the Wild Game dinner that Worth was enjoying with the guys right before my water broke. The dinner that kept my man in town! A few cell phone pictures, and pictures from the hospital. Today is also my mom's birthday! She is here being a life saver and helping us out tremendously. Kelly, Angela, and Stella are coming to help celebrate and meet Hollings! What a little sweetie! She is now 1 day old. She was just shy of 2 weeks early. Worth said she would be early, I was expecting late. Needless to say we were caught a little off guard. My doctor was telling us the 2nd generally comes faster and they weren't kidding. They were thinking I was going to need pitocin, but we progressed so fast that we did not need it! Needless to say when it was time to start pushing it only took nine minutes and I could breath, I mean SHE WAS HERE!!! Hollings has arrived. She weighs 7lbs 6oz. Born at 7:09!!! Worth got BellaRose a sled and built her a little hill in our front yard to sled down and all of this has made a believer in winter games out of BellaRose. She just wants to sled with daddy all the time now. Worth has worked pretty diligently on making sure the hill and ramp sticks around even in the warmer temperatures. Of course we have not really been having warm temperatures around here. We are having a true winter that is for sure! We had a blizzard warning yesterday. Praise the Lord Hollings did not come then and we had power! 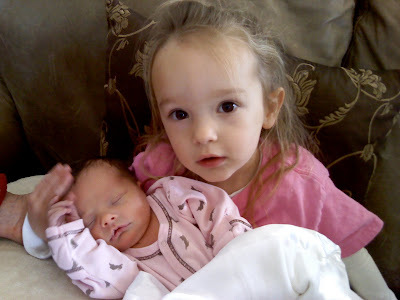 BellaRose already adores baby sister! There is not much to report to you right now. I want to show you pictures of the nursery but Hollings' name is not on the wall yet. Thankfully Worth has work so the name can wait! The nursery pretty much looks like BellaRose's nursery with a few changes that I adore, such as a new chandelier, lamp, picture frames, and polka dots. I can't wait to show you. I am also excited to show you our new double stroller that my Dad and Charlotte got us, but it is not here yet. We decided on a Mountain Buggy. I hope it works out well. We put A LOT of research into this so I hope it was the right choice for us! We have also had quite the winter. I am looking out at yet another snowy icy landscape. I SO wish I could be taking advantage of the snow by going snowboarding but this is not my time. I think that they frown upon 37 week pregnant women snowboarding, plus I could not imagine how uncomfortable that would be! Hopefully next season I can get out there once again. Well that is all for now, I hope you are warm and have power where ever you are!